"As someone who has visited the concentration camp memorials in Germany, I find this over the top. People can question legislation that has passed, but to equate anyone, on either side, to Hitler is in my opinion inexcusable. It's stuff like this that drives the Independents away. And, before anyone says good riddance to that, well, I'd like to point out that is how elections are won. Or lost. I get that people are upset about the health care vote, but really, some perspective here is needed. " Some perspective here is needed, isn't it. Indeed. However there's a problem with that, if you go about getting some perspective... from the wrong perspective... you end up with a perception that perceives nothing of value to your point of view. The real problem with playing 'the Hitler card' is that people look at it from the vantage point of our end of history... which makes the value of history worthless. History learned and applied from the perspective of having all it's answers, leaves you unable to perceive the questions happening all around you in the present. If you want to learn something more from Hitler than the effortless knee jerk response of 'Never again! ', try looking at Hitler from the point of view of the time that he was introduced to the people, as Werthmann does in her article, or in these videos (Part 1, Part 2, Part 3 ). You need to approach History as much as is possible, from the point of view of the people who lived it, and try to see events as they must have at that time when our history was merely their present - then you might be able to connect some dots and gain some value from it. Google up those campaign rallies... not the massive Nuremberg rallies, but the small and personal appearances, the open car campaign drives through the streets, the book signings, what you should make a particular effort to take notice of is the numbers of smiling people lining the streets, jostling each other to wave... smiling. Smiling. That's important to take note of. Why do you suppose they were smiling? Unless you think there was something inherent in the German people that caused them to say "Oh My! Vat an Eevil man! How Delightful! Think of the obscene carnage and destruction he has in store for us!"... if you think it was unlikely they had that response to him, then all those smiles should cause you great interest and concern. 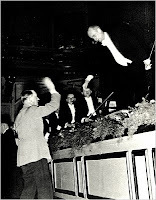 Just for the moment, try to forget about the evils which surfaced later on, look at the platforms that he and the National Socialist German Workers Party ran on, the social safety nets they campaigned on, and delivered... hence the smiling and waving crowds. Herr Hitler was not perceived in his time as the evil ogre of our history books, but as a very popular politician, someone who promised to bring, and did bring, popular reforms to the people, reforms for providing free education, free health care, a minimum wage, promoted the arts, job security, a take over of the big bad banking system, policies which nationalized troubled industries and created or saved thousands of jobs and put Germany back to work. Think of the industrialists who welcomed Herr Hitler, who welcomed the State nationalizing industries, while keeping 'ownership' in place (and try not to think of GM, Chrysler, AIG or that portion of the new Healthcontrol bill that nationalizes the Student Loan industry... nooo... move along... nothing to see here). 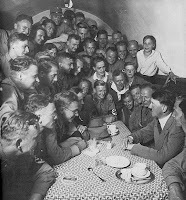 Everything he did was welcomed and popular with the greater masses of 'common sense' Germans, who afterall, still actually thought that they were free. Keep that in mind... and then recall the nightmare which those popular policies and common sense solutions led to. Once you've got that juxtaposition in mind, then wipe Hitler from your consideration completely, and look at the particular policies he implemented, what they rested upon, and how he implemented them. One thing you should take notice of is the dilution, and the eventual wiping out of property rights, which was politically sold, initially, as making things fairer for the common man, giving him a break - and keep it in mind that where this all ends up at, is the loss of all individual rights, the loss of all rights to property and then eventually the loss of a right to life itself. Now that that's got your attention, take your attention off of Germany for the moment. Look at how other nations have implemented similar policies. Forget about the various 'isms they go by, socialism, communism, fascism - those are only different skins of style and presentation that were appealing to their people in their time - at their core, they all run upon the same core principle, the promising of new positive Rights, "Rights to..." (a job, a house, an education, to old age care, to healthcare, etc), 'Rights' which can only be given to 'the people' through the negation of their property rights for the stated (and probably sincere) purpose of doing good and benefiting their people, which requires also necessarily saving the people from being hoodwinked and influenced by hostile speech. Take a look at how those earlier policies end up. Perhaps they all do not end up as did Robespierre's France, Mussolini's Italy, Hitler's Germany, Lenin's Russia, Mao's China, Pol Pot's Cambodia, Castro's Cuba... but there are enough of them that did, so that it should at the very least give you some pause when you hear popular politicians proposing policies that have core similarities. And I wouldn't take all that much comfort from the apparent exceptions of modern European social democracies... they've been propped up by the USA for half a century... though you might want to take a look at Greece lately for a clue as to what may be developing now that we are no longer in a position to step in and help. Take a look at the agricultural policies that were implemented in the USSR and China - the famines which claimed the lives of tens of millions of their own people. While of course there's no direct comparison to our situation, you should still have a look at what's happening in California's San Joaquin Valley, and the destruction of millions of acres of the most productive farmland in the world in order to 'do good' for the environment and the Delta Smelt. Pay attention to the areas 20% unemployment and the lack of response from those people with the power to turn on the faucets. For a fish. Done because those with the power to make policies to do what they think is valuable, a higher good, they turned productive farmland to dust in an attempt to do good. Take a look back at what the efforts of the left to 'do good' for blacks did to the structure of their families, to their neighborhoods, to the rise of crime and violence in their neighborhoods, as a result of the various welfare policies set in place to help them. Take a look at the results of what congress did, in an effort to make homes more affordable, to the mortgage industry. Look at how the well intentioned efforts of Democrats and Republicans to 'manage' the price of healthcare over the last 70 yrs, has resulted in the steadily rising costs of healthcare (two good short summaries can be found here and here). Think of how the well intentioned ideas and rulings of people like Supreme Court Justice Oliver Wendell Holmes to prevent the multiplication of 'botched' peoples, enabled them to mandate that a 'feeble minded' woman (later shown not to be) should be sterilized, should be prevented from having children, for the greater good. In America. Here. No 'Hitler' in sight. But again, for the moment forget about what we know of these failed policies now, and think only about what those policies of Herr Hitler's accomplished in Germany while he, and they, were still popular... they spread the wealth around, they pleased (and enriched) many successful industrialists, and they did that by consolidating power into particular agencies established by experts to put things in order and to look out for the people. They did that by giving government agencies the authority to put things 'to right', to make things more efficient, more fair... by ignoring some peoples rights, for the benefit of others; they did all that in one way or another, by negating the rights of some people to their property, and then spreading their wealth around. For the People. For the greater good. It did, and always does, promise to be a good thing. But have you ever taken a good look at what good things have relied on in the past to accomplish good? Do they really resemble each other at all? Look at the historical facts, does 'the greater good' come from the intent of bureaucrats to do good, or from allowing people to do the good they can do for themselves? Evil things never, NEVER come in to human affairs with the intent to wreak destruction and to do evil - they always come in with the intent of improving things and doing good for the people. For the children. For the Elderly. Forget about when it looks like someone is playing the 'Hitler card', don't let yourself be distracted by his name or his face, look at the fundamentals of the policies in question, and see if you see any similarities between them. That is the only way to learn from history and to ensure that it really will happen 'never again'. This is a keeper, and one to share. Not too long ago, I watched the Jimmy Stewart movie Mortal Storm, made in 1940 and set at the time that Hitler was elected Chancellor. The principals are all at a party when then news of Hitler's election comes over the radio. Your post reminds me of the characters' reactions. Most were elated. These were all patriots who wanted to see Germany brought out from under the oppression imposed by the treaty of Versailles. They were not evil people. FYI. More new evil for the greater good. Evil things never, NEVER come in to human affairs with the intent to wreak destruction and to do evil - they always come in with the intent of improving things and doing good for the people. I partly disagree with your use of the word “intent”. Murphy’s law, unintended consequences, opportunistic evil arising from the created chaos... certainly does happen. And I’d say, is today, the major reason for resultant concentrated power evil - what with people getting better educated and all. But as you know, my pet peeve is the successful Dr. Evil who knows how to leverage power via carefully selected useful tools. The “Follow me and I’ll make all your dreams come true!” strategy being the usual M.O., the drive for power and control being the usual hidden motive. I’d replace “intent” with “promise”. It’ll cover more bases. Anyways... They’re saying that states can opt out of the HCR individual mandate. It would have been more interesting if the thing failed at the national level, but succeeded in various forms in some states so we could track effects. Hey, how about proposing that Missouri be proclaimed an experimental state where all government mandates must be test driven first? If I was to psychoanalyze Hitler, I’d say he was a born power and control freak who became badly skewed by the childhood beatings he had to helplessly take from his father (and also by his small stature... failures in Vienna... his latency?.. maybe the one ball thing...) and rode a bizarre wave of timing and fortune into infamy. But he also couldn’t have gotten there if he didn’t instinctively know how to grow and manage power. Usually people with genuinely ‘good intentions for all’, wind up dead or marginalized because they don’t care to understand power. I think Hitler’s real motive was not for “his” people, but the rush he’d get by having full control over rebuilding Germany as he saw fit. He saw (and felt) that people were more like little props in a ginormous lego play set, and less like individual human beings. Merl said "I partly disagree with your use of the word “intent”. Murphy’s law, unintended consequences, opportunistic evil arising from the created chaos... certainly does happen. " Well... I wasn't really speaking of the likes of Hitler himself, but of how, in their case, the German people perceived and supported him and that relation to, in our case, how Americans perceived and supported Obamao. The casual voter accepts the 'common sense' explanations that 'it's for the good of the children', 'it's for the good of the environment', 'it's for the good of the economy', etc. They intend 'good things', whether or not the leader in question sincerely intends to 'do good' or not. "what with people getting better educated and all." "Anyways... They’re saying that states can opt out of the HCR individual mandate." We're trying to force the issue with a state constitutional amendment that would prohibit the Fed Govt from mandating that Missourians must buy a healthcontrol product or be fined, penalized and/or imprisoned for not doing so. I put up a post on it's passage through our House, and I was at the Senate debate yesterday, which I'll post on soon. "If I was to psychoanalyze Hitler, I’d say he was a born power and control freak who became badly skewed by the childhood beatings he had to helplessly take from his father..."
"rush he’d get by having full control over rebuilding Germany as he saw fit. " "I’d replace “intent” with “promise”. It’ll cover more bases." Well... I'd say their intent is their promise, the successful fulfillment of which will never come to pass, having not the slightest promise of succeeding, since they are fully opposed to reality, as was their intent in the very beginning. All variants of Proregressivism, Socialism, Marxism, Communism, Fascism, etc, seek to replace reality with their desire for how reality should be, and they see the individual as of no more worth than a means to their ends, and Individual Rights (and their vital foundation in Property Rights) as being threatening obstacles to their attaining those ends. The only qualms they feel for abusing, or doing away with either Individuals or Individual Rights, rests entirely in their estimation of whether or not they are likely to be caught and penalized for their actions. "Usually people with genuinely ‘good intentions for all’, wind up dead or marginalized because they don’t care to understand power." There was a fellow who became a convenient martyr to the cause for the Nazi's when he died in some of the street rioting between the Nazi's & the Communists... 'Heche'? 'Heine'? I can't remember, but he was written into a song and trotted out at all the campaign rallies as a useful prop, because he supposedly said something like "My life isn't important, only that our party triumphs!" or some such blather. In any and all such movements, those who don't understand raw power, become the fascist fodder which fuels and is consumed by their 'movement'. Excellent summary. Saved for future reference. BTW, I finally caught up on older OC posts and comments and read about your son joining the Service (Army?). Please tell him I greatly appreciate his service and although he doesn't know me nor I him, I'm proud of him! I will pray for his health and success in this most challenging chapter of his life, my friend. Oops! Air Force. Sorry, I didn't read far enough back. Hey Ben, good to see you! Thanks re Ryan, and I will pass it on. I've been mysteriously locked out of blogger for a couple days, couldn't open any blogspot site on any of our PC's, I just finally got back in last night... I'd been able to read things from my PocketPC, but not able to comment.